So for weeks now, all I have been hearing is "banana this" and "banana that". My staff natters on incessantly about bananas. So, yesterday they gathered around to get my opinion on their beloved fruit. As they stared at me expectantly, I sampled my first banana. It was sticky and awful. I choked down a few bites, just in case it improved, but, alas, it only got worse. I rendered my verdict: bananas are digusting. I would rather eat nearly anything to never have to endure that taste and texture catastrophe again. So what happens today? Today they try to sneak bananas into my oatmeal!!! Maybe they had some extra they had to use up. Maybe they thought my sensitive palate could be fooled into eating more of their overhyped dreck. I am not going to pretend to understand their rationale. I thought I was pretty clear in my pronouncement on the subject yesterday. So today, I added a new move to my repertoire to show my distaste. 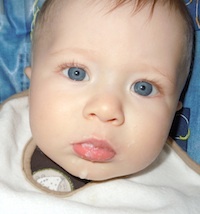 I did this clever little thing with my mouth, while looking aghast with my eyes. I think The Chef caught on to what I was trying to communicate right away. She called my maneuver a "gag". I didn't think it was that funny, but they did stop feeding me those dreadful bananas. On behalf of the Tiny Diner, this is just an administrative note to acknowledge that it seems to be kind of hard to comment on this site. I think that if you "Login" to post comments, you are supposed to be able to click on Join this Site from there and post. But I have come to realize that this doesn't always work. Any assistance from anyone with experience with Google Friend Connect would be appreciated. The Chef has informed me that (gasp) she will not be lovingly hand pureeing my food each night. She has told me that some evenings I will be receiving food that has been handmade and then frozen. Shudder. Next thing you know, she will be pulling my Bumbo up to a TV tray! Today The Chef made me Roasted Sweet Potato Puree with a Dash of Extra Virgin Olive Oil. It was delightful! Clearly superior to my previous meals of squash, avocado, oatmeal, and carrot. I felt compelled to swallow most of every bite. 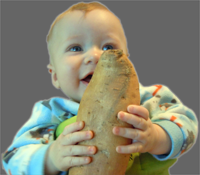 In fact, I feel as though I could have eaten the entire sweet potato, although, as you can see, it is quite large. The Chef said to me that I finally seem to be "catching on," to which I retorted that I would have swallowed my food earlier if she had bothered to make something that was clearly edible. The Chef did note that this was probably the first dish she has prepared for me that she would have eaten herself. Hopefully this insight will guide her future culinary decisions. After only two days, The Chef has called off Operation Avocado. It is true: I haven't been eating a lot of the avocado. I am happy to eat 3-4 bites, but after that, I feel I have proven my skill at avocado and am ready to move on to new challenges. The Chef seemed to feel some despair over my sparse eating. She says I don't really "get it." Everyone knows that the sport of eating involves moving the food off of the spoon by whatever means necessary, and getting to the spoon. I don't know what she is complaining about. I get to the spoon every single time! 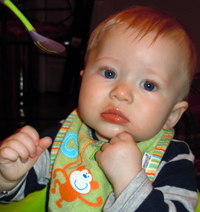 Sometimes I even try an advanced move by assisting her with putting the spoon in my mouth. Eating? Of course I "get it." It is not complicated like Cricket or Bridge. I think, perhaps, she is just trying to keep me from having an inflated ego. The Chef (who also happens to be my Personal Groomer and Stylist) says that now that I have teeth, and now that I eat food, I need to add some new activities to my regimen. Specifically, she has suggested that I begin to brush my new teeth. Conveniently I own 3 toothbrushes! 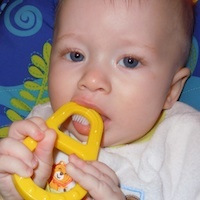 As I only have 2 teeth, I have an extra brush, should a third tooth appear. Here I am, using my snappy yellow toothbrush on my right tooth. So it appears the Chef thinks this "food" thing should happen every day! She plagued me with squash for two more days! At first I thought I might have to keep eating it until all the squash was gone. But this morning she showed up with something new. Well, not really. It was "baby oatmeal", which the Chef says is not like baby peas, baby corn, or anything like that. It is not oatmeal that is really small and cute. It is oatmeal that is "easy to digest." The first batch didn't seem all that tasty. The Chef mixed it with water. The second batch (a small experimental appetizer The Chef prepared before my usual lunch) was mixed with MF, and this was marginally better. My chauffeur (a.k.a. Dad) totally misunderstood my request to flee last night. * Thus, I was still here today to take part in The Chef's "food" scheme. Since escape was an impossibility, I steeled myself for the experience, and decided to get it over with as quickly as possible. Towards that end, I woke The Chef at 6 AM. I was invited to chomp down on a plastic spoon. I really quite enjoy gnawing on colorful plastic. It is pretty much what I do during that time of day anyhow, so none of my plans were really disrupted. Several members of my retinue watched me eat, with laser-like attention given to each bite, rather like a bunch of sycophantic half-wits. I do enjoy this level of attention. I was still given some of my favorite custom-made food (let's call it MF, for mamafood from now on) afterwards. All-in-all, not a bad experience, although it was puzzling to have my Chauffeur feeding me. Now that I have gotten this experience out of the way, hopefully things can get back to normal around here. 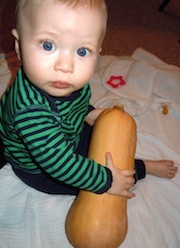 *Instead I was given a shoulder-ride, which did momentarily divert me from my worries about the size of the squash. Since the advent of my new teeth, The Chef has decided to move up the date of my first food to (drumroll please): Tomorrow! "Why don't you just take a look for yourself?" after which she handed me a squash. Have you seen the size of this thing? How does she expect me to eat this? I am sure this monstrosity weighs more than my head! This casts the entire "food" project in a even less positive light. My healthy skepticism has turned to alarm! I mean, what does she expect me to eat after this? An elephant? If I had the means to do so, I might consider fleeing in the night. She assures me that it will seem more palatable once mealtime arrives. In the meantime, I have 24 hours to consider escape routes. I have discovered that having teeth hasn't granted me the level of power I need to function without an extensive staff after all. As such, I have had to (hat in hand) invite my Chef, Chauffeur, Laundress, Valet, Groundskeeper, Personal Shopper, and other sundry staff members back to work. Since I had sent them home, and it appears they live with me, it did not take too long to get back to business as usual. It also explains why they are always milling around, even when they are not engaged in a task directly related to my care and well-being. They were too busy admiring my new teeth to notice that I had dismissed them.